The thirteenth century was a turning point in the physical evolution of western European countries. As Francia moved south to dominate Occitania, for example, the outlines of a future France can be discerned in the union. The collapse of the Hohenstaufen dynasty into the Great Interregnum marks a decisive turn for Germany. Less familiar perhaps are the sweeping changes by which the Spanish peninsula lost its ancient configurations and assumed a “modern” geopolitical shape. The crusading victory of Las Navas de Tolosa in 1212 broke the power of Spanish Islam, plunging the Almohad empire and al-Andalus int oa confusion of civil wars from which it never recovered. Saint Ferdinand (III) of Castile, definitively joining to his dynasty the kingdom of León, swept ruthlessly over the central fragments of Spanish Islam until only the pathetic rump-kingdom of Granada remained at the peninsula’s southern tip. Castile-León had suddenly expanded from covering a seventh of the peninsula to covering the larger part of it, including a seacoast protectorate-kingdom of Muslims at Murcia. 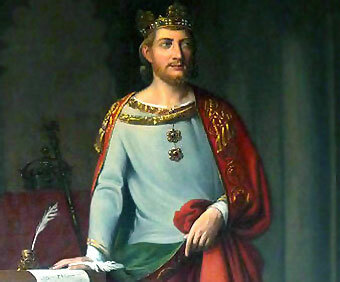 From mid-century Ferdinand’s son Alfonso X the Learned (1221-1284) would labor to unify this congeries, to transform it from a feudal-warrior society into a modern Roman-law monarchy, and to create a cultural expression appropriate to the grandeur of the new country – in letters, science, music and art. This entry was posted in Articles and tagged 13C, al-Andalus, Castile, France, Germany, Islamic, Murcia, Muslim, Occitania, Politics, Roman, Spain, Valencia. Bookmark the permalink.